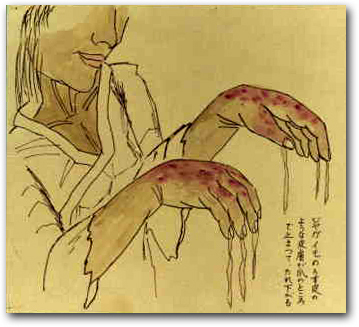 Radiation sickness was often fatal, and quickly so for those exposed to the immediate blast. Even persons who came into the area within 100 hours of the bombing, however, could be susceptible to residual radiation; as time passed, delayed effects such as leukemia and other cancers became identified. This was a curse of an unimagined sort, for no one knew what it was at first, and no one could ever be sure what it portended. 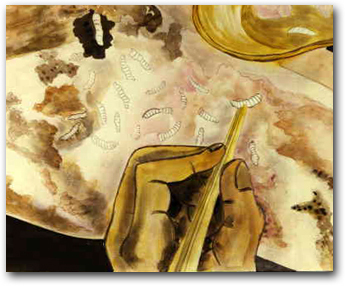 Did survivors carry this man-made seed of death in their bodies? Would they pass it on to their children? With such uncertainties came stigmatization of the hibakusha by other Japanese, and for the survivors themselves what has been called scars of the heart, cancer of the soul, a "permanent encounter with death." Intimation of hell also took the graphic form of what is well known in the special lexicon of the bombs as "the procession of ghosts." When the sudden flash (pika) of the explosion occurred, people in the streets instinctively threw their hands over their eyes; and those facing the explosion, even several miles away, often suffered severe burns on their forearms and hands. (In Hiroshima, the bomb was dropped at quarter past eight in the morning, when the streets were full of workers and schoolchildren.) In another spontaneous phrase, survivors often speak of how skin "peeled off like a glove." Instinctively, to ease the pain and prevent the exposed flesh from sticking, people injured in this manner extended their arms out in front of them; and the streets and ruins soon became full of lines of injured survivors staggering along in this manner. 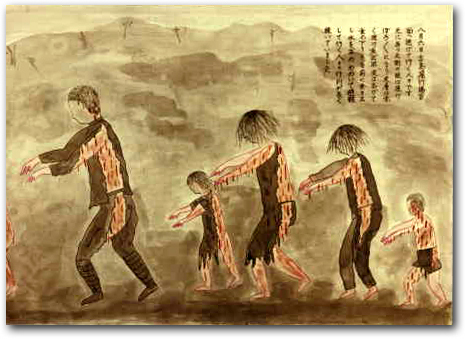 In Japan, as in the West, they fell into the stereotypical image of the "living dead"—humans, once again, made monstrous. A man, skin peeling from his hands, “desperately looking for his child.” Neither the man nor his child survived. Often these were family-like scenes—that is, clusters of men, women, and children. Frequently the figures were semi-naked, and sometimes they were lacerated with cuts from flying glass or other debris. Where were these processions heading? Here the enormity of the disaster became compounded, for there was in fact almost nowhere to go. Most hospitals and clinics had been entirely or at least partially destroyed. Most doctors and nurses had been killed or injured. For days, there were almost no medicines. 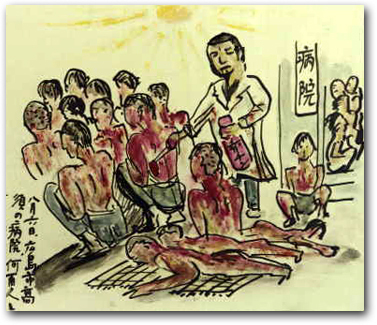 Severely burned victims were treated with mercurochrome. Some of the injured resorted to home remedies such as applying cooking oil to their wounds or rubbing them with vegetables (such as cucumbers). Badly burned survivors being treated with mercurochrome. Uncounted numbers remained unattended for days. Flies quickly found them, and their wounds were soon roaring with maggots. For more than a few survivors, this became the hell scene that would never go away. In this scene from August 17, 11 days after the bomb was dropped on Hiroshima, a child clings to its mother, whose wounds are breeding maggots. The small white box on the ground contains ashes from a cremation. The mother and child were strangers to the artist, who wrote at length separately of the horror of this scene. 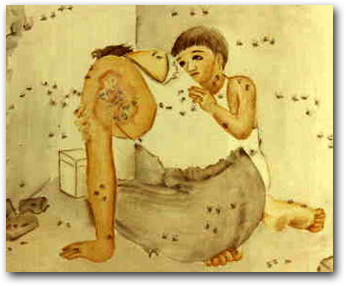 Only four years old at the time, 30 years later the artist recalled the sight of removing maggots from wounds. Some pictures by survivors are striking by virtue of their singular grotesqueness. An injured man gazes at his own eyeball in the palm of his hand. A skeleton sits in an intact, still upright barbershop chair. 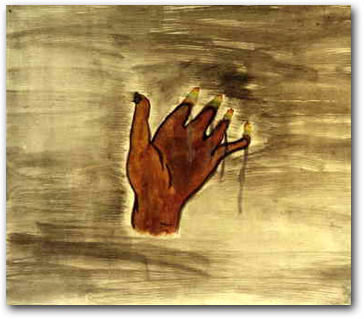 A woman's hand rises out of the rubble, the fingers burning like candles. 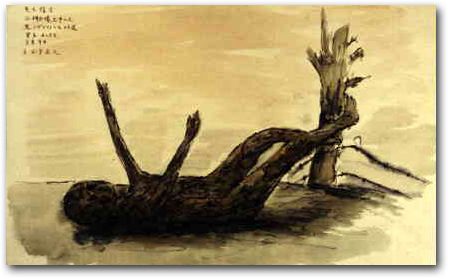 The charred corpse of a child lies on the ground (this a survivor's memory from three days after the Hiroshima bomb) with its arms reaching toward heaven. 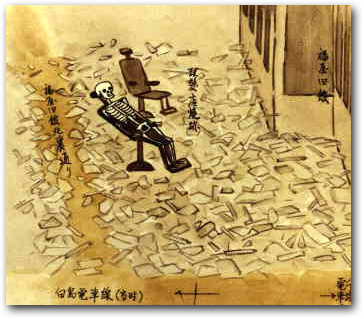 On August 12, six days after the bomb, the artist came upon a skeleton sitting in a still-intact tilted barber’s chair. “Corpse of a child pointing to the sky” about 600 meters from the hypocenter. 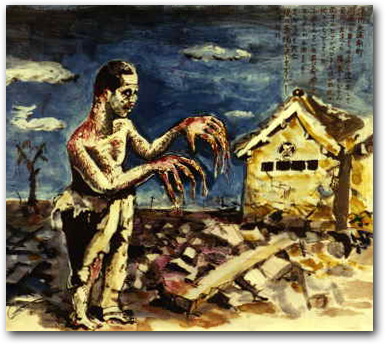 In one exceptional survivor's painting, a dead young Caucasian man is shown tied to a toppled telephone pole near Hiroshima's shattered city hall. 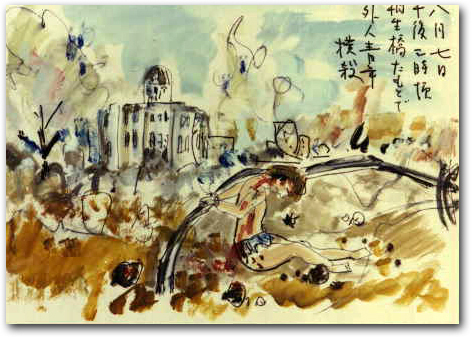 Representing a scene encountered on August 7, this cryptically annotated picture obviously represents one of the little-known Hiroshima stories: that there were perhaps two dozen or so American prisoners in the city when the bomb was dropped, most of whom survived the bomb but were hauled out and murdered by enraged Japanese. “August 7, around 3 p.m.—a foreign youth beaten to death near the approach to Aioi Bridge.” The victim was an American POW who survived the bomb only to be killed by enraged Japanese survivors.